"All mentors have a way of seeing more of our faults than we would like. It's the only way we grow." The quintet of films in the Star Wars saga creates a world beyond the imagination of its viewer. With stunning visual effects as well as a host of fabulously created creatures, director George Lucas has effectively become a fantastic painter wielding a digital paintbrush. In no other installment is this better seen than here, in Attack of the Clones, a masterful exercise in visual storytelling that, while lacking in some areas, still ranks as one of the better efforts in the ever-popular series. Much like The Empire Strikes Back, Attack of the Clones offers a bleaker look into the world of Lucas' beloved characters and focuses on a point when they are most vulnerable. A decade has passed since the events that occurred in The Phantom Menace; problems in the Republic have grown threatening in this time. The former Queen of Naboo, Padmé Amidala (Portman), is now a senator and has arrived in the capital of Coruscant to speak about the troubles in the realm. Shortly after her arrival on the planet there is an assassination attempt, forcing two Jedi protectors to be dispatched. The Jedi in question happen to be Obi-Wan (McGregor) and Anakin (Christensen), each of whom have previously crossed Padmé's path. The protection of the Senator sends each Jedi a different way: Obi-Wan follows the trail of the assassin to a water-drenched planet where a massive clone army is being formed. Once there, Obi-Wan finds a bounty hunter named Jango Fett (Morrison) who is involved with the mysterious Count Dooku (Lee), who in turn wants nothing less than an end to the Republic. Meanwhile, Anakin escorts Padmé to a remote location to keep her safe, and soon the pair fall in love. Their time together takes them to Tatooine in search of Anakin's mother, though what Anakin finds sends him further into frustration and rage. The central theme of Attack of the Clones is essentially a love story, a tale that brings the two lovers together and pushes the series towards completion. But strangely, this also represents the dullest aspect of the otherwise kinetic Attack of the Clones. The dialogue between Anakin and Padmé is clunky in its construction, dramatically inhibiting the universal pace of the picture. Obi-Wan's scenes have vibrant energy that continues to build until the plot shifts away from him to the love story and the pace slows down to a drag. Thankfully, an absolutely amazing climactic battle picks things up again and creates one of the most thrilling action sequences in any Star Wars film. Attack of the Clones stands above The Phantom Menace in nearly every aspect, especially the previously mentioned finale. Lucas creates organized chaos by throwing angry creatures, storm troopers, and a large assembly of Jedi into an arena-style battle that will be remembered for years to come. The closing light saber duel between Dooku, Obi-Wan, and Anakin is a fitting addition to the gallery of climactic duels, though this one is a bit more special. The inclusion of the pint-sized Yoda into the fray creates perhaps the single most thrilling moment to be seen on film this year, as we finally find out just why Yoda is said to be the greatest of all Jedi. The work done by Lucas and ILM is that of flawless craftsmanship. As told in the commentary track included on the DVD, many of the sets are completely computer-generated, which is impressive considering that the interiors look so real. The effort put into the digital actors is also amazing; both Yoda and Jar Jar Binks (yes, he is back) are so richly detailed that even the way that their digital clothes sway as they move looks incredibly lifelike. The greatest achievement is that of the newly animated Yoda. One needs to look no further than the reaction shots of the Jedi master as he interacts with a human counterpart. The ways in which his ears, eyes, and mouth move are so stunning that I was baffled to think how this could have possibly been done so well. The human members are not as exciting as their digital counterparts, but the acting is a large improvement over the last installment of the series. As Anakin, relative newcomer Hayden Christensen does a fine job in laying the seeds needed to make the viewer believe that his turn towards the evil side is only a matter of time. The standout moment for Christensen occurs halfway through the film when he visits his former home; the rage and frustration seen on his face offer no doubt that Anakin is slipping further into despair. McGregor and Portman allow their characters to grow, adding depth to their development. Lee makes for a fine villain, though his screen time is sadly limited. Samuel L. Jackson's role as Mace Windu grows considerably, and seeing Jackson wield a light saber is one of the pure pleasures in this life. It is difficult to determine where exactly Attack of the Clones rates with other films in the series, but with his second prequel, Lucas seems to be back on the right track. Episode II offers a darker look at the saga that many have been waiting for, though the love story holds the pacing back. Episode III is rumored to be the darkest of the six films, something I welcome given the way in which Lucas handles aspects of Attack of the Clones. Image Transfer Review: Director George Lucas shot Attack of the Clones on high definition digital video, a factor that caused complaints from many when the film was shown in the 35mm format. Some said the image was murky and that it was hard to distinguish some sequences shot at night. For those who had the pleasure of viewing the film in digitally-equipped theaters, there were universal accolades. Thankfully the 2.35:1 anamorphic transfer used for this DVD was taken directly from the digital source print, a fact that has helped to create the most fantastic image transfer I have ever seen. The colors are the most impressive aspect of the transfer as they seem ready to jump off the screen at any given moment. The lush locations seen in the Padmé and Anakin storyline are picturesque, while the darker sequences including the final third of the film show no grain at all, and the colors are richly detailed. Sharpness and detail are also off the charts in terms of quality; the smallest detail can be spotted perfectly on this DVD, which is helpful in the opening chase sequence through the nighttime skies of Coruscant. No pixelation or edge enhancement can be found in the transfer. One of, if not THE best transfers available on DVD. Audio Transfer Review: On par with the video is the Dolby Digital 5.1 EX mix used for Attack of the Clones, as the quality of this soundtrack is enough to make even the most diehard audiophile giggle with glee. Where to begin? Maybe with the terrifically detailed light saber battles in which the sound of the weapons slice through the room. Perhaps the asteroid sequences where the sounds of explosions as well as seismic charges will send you back over the sequence time and time again. Put simply, this mix has everything, from clear and sharp dialogue in the center channel to small ambient effects such as a waterfall or even drops of rain in the left and right speakers. The final act is an audio assault as the mix does not quiet down for a second, including several explosions that will have your sub woofer shaking your house. Extras Review: Like The Phantom Menace before it, Attack of the Clones comes packaged as an feature-filled, two-disc set from Fox and Lucasfilm. The majority of extra material can be found on the second disc, though a feature-length commentary track on disc one is certainly not to be missed. George Lucas, executive producer Rick McCallum, sound designer Ben Burtt, animation supervisor Rob Coleman, and effects supervisors Pablo Helman, John Knoll and Ben Snow are all involved in the screen-specific commentary track. Each participant has been recorded separately, though the track is blended together so well that it is hardly noticeable. Lucas is far from being the ring leader here, though he does offer perhaps the most insight in terms of plot and story. He mentions moments where a seed is planted for something to happen in Episode III, as well as lesser characters here who will evolve into something more in the third installment. The track is largely technical, with an in-depth look at the audio and visual effects. The most fascinating parts for me are as the visual effects team point out in-jokes that can be seen in the distance in several scenes. As a counterpart to The Beginning (the terrific, in-depth documentary found on Disc Two of The Phantom Menace), From Puppets to Pixels is a fifty-five-minute documentary on the process by which the digital creatures were created. Special effects supervisors as well as animators offer the viewer a nice look at the effort and painstaking hours that went into creating a believable menagerie of characters, including the diner worker Dex, the Camino race, and of course, Yoda. Animation director Rob Coleman (some of his thoughts here are very similar to those that can be heard on the commentary track) takes the viewer deep into ILM, which is fun, but From Puppets to Pixels becomes boring once you have seen the beginning steps. The journey taken to get there is not nearly as fascinating as the finished product. Next up is another documentary entitled State of the Art; The Previsualization of Episode II. Gone are the days of old-fashioned storyboarding, as now thoughts and ideas of what a scene should look like are done via computers. This interesting documentary runs nearly half an hour in length as animators go from concept to realization. The speeder chase, droid factory, and Clone War battle are showcased. Films Are Not Released, They Escape is perhaps my favorite as it takes the viewer deep into the aural experience created for Attack of the Clones. The daunting work of foley artists, ADR mixers, and sound editors is featured here. The droid factory sequence is the most amazing construction, as the viewer gets to see just where the sounds came from. A host of web documentaries are included, though the entire collection has already been available at starwars.com for quite some time. These segments include: Here We Go Again (a look at shooting on digital video) , Wedgie 'Em Out (the creation of the starfighter), We Didn't Go to the Desert to Get a Suntan (shooting on location in hot temperatures), Trying to Do My Thing (the casting of Hayden Christensen), A Twinkle Beyond Pluto (casting extras), It's All Magic (more visual effects), Revvin' It to the Next Level (more sound design), A Jigsaw Puzzle (building miniatures and models), Bucket Head (the Fetts), Good to G.O. (all about the Jedi), P-19 (creating Natalie Portman�s wardrobe) and Reel 6 (the climactic action sequences). Each of these interesting featurettes run approximately six minutes. Three other featurettes, entitled Love, Story, and Action each run ten minutes in length. These are the most character-driven featurettes on the disc and are very interesting. The Action piece is perhaps the best as it deals with the swashbuckling adventure that has been on display in every film. OK, now for the deleted scenes. Eight deleted scenes have been touched up and polished for inclusion on this DVD. Lucas and ILM have gone through the excised sequences and added visual effects as well as introductions as to why each scene was cut. The bulk of the deleted scenes deal mainly with the love story aspect, though one does show us more of what happens to Anakin and Padmé when they are captured after the Droid Factory sequence. The scenes included are: Jedi Temple Analysis Room, Padme Addresses the Senate, Obi-Wan and Mace—Jedi Landing Platform, Extended Arrival on Naboo, Padmé's Parent's House, Padmé's Bedroom, Dooku Interrogates Padmé, and Anakin and Padmé on Trial. A series of photo galleries as well as a visual effects breakdown montage are accessible from Dex's Kitchen and are interesting, though not overly entertaining. Also available is a six-minute preview for R2-D2: Beyond the Dome, a six-minute trailer for the mockumentary on the little ladies' man. Look for a very, very funny line from Samuel L. Jackson about the origins of the little guy. Now then, you want promotional materials, well you are in luck. Attack of the Clones did not receive the large promotional push that The Phantom Menace did, but the effort was certainly still there. Three theatrical trailers are presented in Dolby Surround and anamorphic widescreen. Next up are twelve television spots including the Spider-Man take off, "Biggest Action Hero." Funny, funny stuff. The "Across the Stars" music video is presented in Dolby Surround and anamorphic widescreen and is fun for a one-time viewing. Finally, a collection of posters in various languages and facsimiles of promotional outdoor advertising are available for viewing. All of these extra features are wrapped up in a series of lovely animated menus. Like The Phantom Menace, the menu system alternates from one location to another, and can be accessed by finding one of several easter eggs. Search hard enough and you will find an outtake reel. 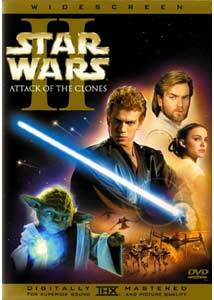 Easily the best DVD of the year to this point, Attack of the Clones offers a trio of perfect attributes. The image quality is the best I have ever seen, the sound mix may be the best reason yet to invest in a high-end audio system, and the extra features are informative and far from merely promotional. Oh yeah, the film is pretty great too. Highly recommended.